Eco-friendly resort Angsana Ihuru hosted a 24 hour scuba diving event to mark the 14th anniversary of its Rannamaari shipwreck and highlight the importance of protecting coral and marine life in the Maldives. Seventy people representing 12 nationalities – including scuba divers representing all levels of experience, underwater photo journalists, and guests – participated in the “10 to 10 Rannamaari wreck” event, kicked off April 25. A total of 138 dives and a 24-hour live webcast broadcast worldwide showcased the extraordinary marine diversity and beauty of the Maldives as well as the unique ecosystem that has developed on the shipwreck. “The Maldives is well known for its natural beauty and among the island resorts Ansana Ihuru in particular is known for its beautiful house reef. The resort was renovated last year and attention was focused on the Marine Centre, because it is the underwater beauty we’d like to share,” said Executive Assistant Manager Henar Rios at the event’s opening ceremony. The resort boasts of having one of the best ‘house reefs’ in the Maldives. 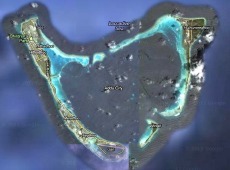 “Seventy-five percent of Angsana Ihuru’s beauty is underwater,” Rios told Minivan News. She further explained that the resort has a 30 percent guest return rate, whereas most resorts average only five percent, even with special incentive programs in place. “The Rannamaari wreck is now a living structure and symbol which is an extension of our reef that we will protect and share with pride,” Rios added. The Rannamaari wreck was previously used as a dredging ship on a nearby island and was towed to Angsana Ihuru in 1999 to be used as an artificial reef. However, the ship sank “mysteriously” several days before the planned event and has since become a home for thousands of sea creatures and corals at a depth of 28 metres. Scuba divers immediately took to the water to explore the reef following the open ceremony, which included a traditional bodu beru (drumming) performance and kurumba (tender coconut) refreshments. Throughout the day divers and snorkelers were rotating in and out the water, exploring the Rannamaari wreck just off-shore from both the Marine Centre and Velaavani (shallow bay) Bar. In addition to the daytime dives, a variety of unique scuba experiences took place to highlight the marine environment’s astounding changes which occur daily, including the “before dusk”, “fluorescent” underwater life, midnight, and “before dawn” dives. A “try scuba” opportunity catered to non-certified divers, with Angsana Ihuru’s professional dive instructors carefully facilitating participants’ first underwater breathing experience in the island’s shallow lagoon. The Rannamaari Play was a highlight of the anniversary celebration events. Resort staff creatively recounted the historical Maldivian folklore tale through a shadow-theatre performance accompanied by music and narration. The sea demon Rannamaari previously terrorized the Maldivian people by demanding the sacrifice of a virgin girl each full moon. However, the Maldivians were saved by a Muslim traveler, who disguised himself as a women and stayed overnight in the temple reading verses of the Quran, causing Rannamaari to disappear forever. Following the traveler’s victory over the demon, the Maldives embraced Islam as a nation in 1153 AD. Immediately following the play, the Male’-based band Flower Rain provided guests with live music at the bar. Throughout the day’s events resort’s staff provided an assortment of delicious refreshments – including traditional Maldivian ‘short eats’ – to guests and participants, demonstrating the resort’s genuine hospitality. In line with Angsana Ihuru’s environmental conservation focus, five percent of earnings generated from the anniversary events dives will be donated to sister-company Banyan Tree’s Green Imperative Fund, which supports community and environmental projects around the world. The Maldivian telecommunications company Wataniya sponsored the “10 to 10 Rannamaari wreck” event. “The highlight of the event was the spirit that was shown by the staff of the island and the in house guests. Plus the online users who kept the momentum going,” the Marine Centre Manager and dive base leader for both Angsana Ihuru and Banyantree Maldives Vabbinfaru Adam Rasheed told Minivan News. “The Rannamaari wreck is unique because you can swim in simply. It is very close to the reef, which means more or less all levels of divers, even a person who is in the water for the first time, will have a chance to see this. “Now the wreck is like an artificial reef. The fish life is very, very good and very special, not to mention so easy to access,” Rasheed said. 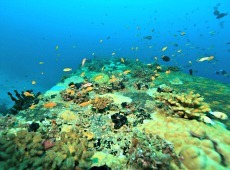 Average underwater visibility peaks at 30 meters, while the reef drops away gradually from the powder-white sandy shoreline. 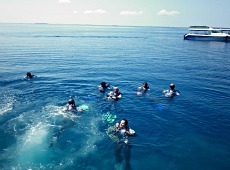 Rasheed explained that the initial idea for the “10 to 10 Rannamaari wreck” event came to him during a night dive. “The dive was really, really good and I wondered when will two of the most important people in my life – my mom and aunt – get the chance to see something like this? So we started to build on that idea to also reflect the reopening of the resort following last year’s renovations, as well as commemorate the 14th anniversary of the wreck,” Rasheed said. “Angsana Ihuru is trying to do something unique with more of a focus on the water and divers, to position ourselves as a dive centric resort. “Over the years Ihuru has had an environmental focus and so we wanted to complement this and take the concept to a new level,” he added. Rasheed further explained that during the recent renovations, the entire dive center structure was changed to reflect the resort’s focus on the underwater environment, diving, and snorkeling. Angsana Ihuru claims to be the first resort in the Maldives to offer SNUBA, where breathing air is supplied from a long hose that is connected to a floating raft on the surface, allowing guests to dive up to six metres. A plethora of marine life frequents the vibrant coral reef surrounding the resort island, including giant moray eels, scorpion fish, stingrays, eagle rays, manta rays, batfish, nurse sharks, big jack fish, and sea turtles. Pictures and videos from the “10 to 10 Rannamaari wreck” event can be found on the Ihuru Funa Facebook or Twitter pages. Sea turtles are being slaughtered en masse in the Maldives with no action taken by authorities to uphold local conservation laws or adhere to international agreements to protect the endangered species. A photo of one such slaughter taken earlier this year and obtained by Minivan News shows dozens of dead sea turtles on a dhoni (local boat). The Maldives is home to five species of sea turtles. Protecting the endangered species is crucial for maintaining environmental health and functioning – and by extension human health – in the Maldives. Without this keystone species the unique Maldivian ecosystems – ocean, reef, sea grass, and coasts – would cease to exist altogether. Reports of sea turtle slaughter, hatchlings kept as pets, and nests destroyed for egg collection are commonplace in the Maldives despite the government recognising the problem through national legislation and international agreements. Approximately 90-180 sea turtles have been killed this year by locals from Kan’ditheemu island in Shaviyani Atoll, who have been traveling to the nearby uninhabited island of Kakaaeriyadhoo to slaughter the turtles and take their eggs, an informed source told Minivan News. “This is a well known nesting island and every night a group is going and hunting the turtles. It is so obvious, every day since January one or two are killed,” the source stated. “They wait for them to nest on the island, or go snorkeling to hunt them. Even on Kan’ditheemu sea turtles that come into the sea grass area are killed. “The police know about this as well as the Kan’ditheemu Island Council, who say there is nothing they can do. “More local awareness is needed and actions need to be taken by the authorities, like issuing fines and jail time. The lack of monitoring is challenge. Additionally, fishing vessels that participate in sea turtle slaughter should be held for a time as punishment,” the source suggested. According to the source, the Shaviyani Atoll Council is not caring for the uninhabited islands and there is no longer a caretaker for Kakaaeriyadhoo. One individual who admitted to killing sea turtles but would not provide his identity, told Minivan News why the sea turtle slaughter occurs. The source acknowledged the legal prohibitions against killing endangered sea turtles, but remains undeterred. He also explained this sentiment is common nationwide, so sea turtle killing often goes unreported. “I don’t know why the government is not taking the issue very seriously. If the government doesn’t worry, then why should we worry? I’ve never heard of anyone prosecuted or arrested, ever,” the source declared. “People don’t know how important turtles are for the environment. Even youth don’t know that’s the truth. “People are not very aware of legal things. If anyone sees [or knows of] someone killing turtles, they won’t report it. Communities are very small and no one wants their friends, colleagues, cousins etc, to get arrested. You’d feel guilty,” the source added. Kan’ditheemu Island Council President Nasrulla told Minivan News that the sea turtle killing is not “directly an issue” because “no one has complained legally”. “It’s a secret thing. People go at night time,” Nasrulla stated. “No one has officially reported this. It’s all been rumors,” he added. No reports have been filed according to Shaviyani Atoll Council President Moosa Fathy. Fathy explained the Ministry of Fisheries and Agriculture is responsible for regulating uninhabited islands. “They have the authority to give any island to a particular person for a long term lease or they can ask a caretaker to look after the island,” Fathy stated. “Atoll councils have not been given the [uninhabited] islands in any atoll. It’s not our duty according to article 153 of the Decentralisation Act. “The Attorney General has to do this within six months, but it’s been nearly three years now. The Local Government Authority and the Ministry of Finance and Treasury have to do a lot. “We cannot lease to any person or change any agreements. Two or three years before an uninhabited island would be given to a caretaker, but those agreements are not valid now,” he added. Minister of Fisheries and Agriculture Ahmed Shafeeu told Minivan News that the ministry has not received any reports of sea turtle slaughter from the Kan’ditheemu Island Council or Shaviyani Atoll Council, but said he would look into the matter. Shafeeu explained that in February 2012, the Fisheries Ministry handed over uninhabited island care to the atoll councils. The councils are expected to assign caretakers and look over leases issued by the ministry. “It’s their responsibility to properly look after these islands. However, it’s not a requirement that someone always has to be stationed there,” Shafeeu stated. “There are issues with atoll councils taking responsibility for uninhabited islands as per the law. They are reluctant because they have not been given the authority to lease these islands,” he added. Shafeeu emphasised that anyone identified or suspected to be participating in sea turtle killing should be reported to the police, who should take action to enforce the law. “Sea turtle capture and slaughter are unlawful – it’s completely forbidden. They are protected. It is a criminal offense and there are penalties for that. “Any responsible authorities that receive any reports that come, need to attend to it immediately. Any responsible person can report directly to the police,” Shafeeu added. In late 2012, 104 hatchling sea turtles were taken from Kakaaeriyadhoo in Shaviyani Atoll and sold to islanders on Kan’ditheemu. Earlier in 2012, a marine biologist working in the Baa Atoll UNESCO Biosphere Reserve reported the discovery of the remains of a baby shark and endangered sea turtle barbecue on the uninhabited island of Funadhoo, one of the country’s 14 priority nesting beaches legally protected under Maldivian law. In 2010, sea turtles were discovered dead on the beach of Laabadhoo island in Gaafu Dhaalu Atoll, cut open for their eggs and left to rot on the sand. Environmental conservationist and Kan’ditheemu resident Hassan Solah discussed the endemic problem of sea turtle slaughter with Minivan News. The turtle fat and derived oil is believed to be an aphrodisiac that works similarly to erectile dysfunction drugs, such as viagra. Solah explained this belief is common throughout the Maldives and the ‘aphrodisiac’ oil is referred to as ‘theyokundi’ or ‘velaakaleyya’. Eggs are also taken from sea turtle nests or gutted from dead adult sea turtles and cooked in a similar fashion to chicken eggs. The eggs are used to make the dish ‘velaa folhi’, similar to quiche. “It’s not a tradition to eat sea turtles. We grow up only eating tuna, garudhiya (fish soup eaten on rice), rihaakuru (fish boiled down into a thick paste), and curries are recent since they began incorporating spices from India and Sri Lanka,” stated Solah. Conversely, a source who has participated in sea turtle slaughter explained there is a cultural history of killing turtles for their meat and fat-derived oil. “The practice of killing sea turtles is very traditional in many ways. We eat the flesh and the fried fat,” the source stated. “We also used to use the oil [derived from their fat] for lights in our homes. The sea turtle oil was previously put on dhonis (boats) to protect the wood from fungus. “Island communities used to make a huge feast where everyone would eat together. People would catch six or seven turtles. This stopped around the 1980’s. “There used to be a big store owned by the island chief. During that time if anyone caught a turtle they would have to give the oil to the shop,” the source added. Some of these practices have stopped because “traditions change”, he said. Protecting endangered sea turtles is vital given the environmental pressures the Maldives already faces – which also amplify threats to turtles – such as extreme vulnerability to climate change impacts, declining fish stocks, as well as the lack of waste management and the resulting pollution on most islands. “Sea turtles are a big part of the food chain. All species are sea grazers and keep the ocean in balance. They need to be protected and saved,” stated Solah. “They eat jellyfish, which have become a huge problem in some parts of the world. Hawksbill turtles primarily live on the reef, while green turtles maintain the seagrass. Because sea turtles eat predators, this allows juvenile fish to grow and flourish. They also keep algae blooms in check,” he added. Solah also explained that protecting sea turtles and leaving their nests untouched is essential for protecting coastal erosion. “Turtles also support coastal ecosystems. When they lay their eggs, a few do not hatch. This is important for providing the shoreline with nutrients so trees are able to grow; their roots then hold the sand in place,” he said. There is currently a nationwide ban on catching or killing sea turtles and under this moratorium 14 priority nesting beaches are protected, however collecting eggs is still permitted. The Environmental Protection Agency (EPA) of the Maldives has voiced its concern regarding the ongoing killing and capturing of protected species, such as sea turtles, and has urged these illegal activities stop immediately. In March of this year, the country acceded to Convention on International Trade in Endangered Species of Wild Fauna and Flora (CITES). This treaty aims to ensure the international trade in specimens of wild animals and plants does not threaten their survival and legally requires the Maldives to adopt domestic legislation to ensure national implementation. The Maldives became a party to the Indian Ocean South-East Asian (IOSEA) Marine Turtle Memorandum of Understanding in July 2010. 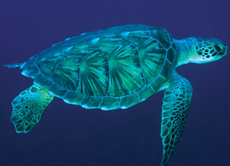 This international agreement seeks to conserve and replenish depleted marine turtle populations via an associated conservation and management plan that focuses on “reducing threats, conserving critical habitats, exchanging scientific data, increasing public awareness and participation, promoting regional cooperation, and seeking resources for implementation”. The Maldives committed to the international Convention on Biological Diversity (CBD) in 1992, requiring the country maintain biodiversity and the conservation of endangered species. The Convention on Migratory Species (CMS) has not been ratified. Keeping these ecosystems health is vital to meet Maldivian subsistence needs, as well as maintain the fishing industry and attract tourists. Both sectors account for approximately two-thirds of Maldivian GDP. “Sea turtles are protected and by keeping their populations up, more tourism profits can be gained. Every day tourists pay a lot of money to see the turtles. They will stop to visit a local island and spend money in local businesses for a full day trip,” stated Solah. “Instead of killing sea turtles, turtle ‘points’ should be protected, so in the future it will become popular and many dive boats and safari boats will come. “This is what happened Ari Atoll with whale sharks. Local islanders used to hunt the whale sharks, but now they have a daily ‘show’ for tourists that explains how they used to hunt the sharks, what tools they used, and it generates lots of money from tourist excursions,” Solah added. Maldivian civil society is holding Earth Hour events today (March 23) to highlight the urgent need to take action against climate change and care for the environment, while the Ministry of Environment and Energy “facilitates”. Earth Hour is the “single largest mass participation event in the world” aiming to mobilise people to take action on climate change by switching off their lights for one hour as a “massive show of concern for the environment”, according to the event’s website. Earth Hour Maldives aims to “obtain the full cooperation of the community, non-government organizations, companies, tourist resorts, government ministries and agencies and the school community, to effectively make Earth Hour Maldives a success and to demonstrate to the world where the Maldives stands in the battle between Earth and Global Warming,” the site states. The Scout Association of the Maldives has taken the lead organising Earth Hour events, particularly in the capital Male’, since the Maldives began participating five years ago. “The WWF and Earth Hour Global event hosts prefer associations organise events, focus on youth involvement, and receive support from the government,” Earth Hour Maldives Marketing Manager Mujahid Abdulla told Minivan News. “The Environment Ministry is making policies, such as the vehicle ban from 7:30 to 10:30 tonight. “The presidential palace will be the first place to have its lights switched off, as well as the ‘front line’ of Male’. We expect 40 to 50 percent of buildings to shut down their lights,” according to Abdullah. The Environment Ministry’s Earth Hour media focal point, Mohamed Mushaaid, explained to Minivan News that all government buildings have been requested to shut their lights off for the designated ‘earth hour’ between 8:30 and 9:30 pm, however compliance is voluntary. “Earth Hour is organized by the Scout Association of the Maldives, while the Environment Ministry is facilitating the event by providing resources, coordinating help from other government ministries, and providing technical help. “We are strongly suggesting island councils participate, but it’s not mandated,” stated Mushaaid. He further explained that scouts have been going ‘door to door’ raising awareness and cooperation for ‘lights off’, while advertisements and announcements have been made on ‘variety shows’ providing information about the event and advertising people to avoid energy usage during the designated earth hour. Updates of energy savings in ‘real time’ will be given on local television. A vehicle ban will be implemented in Male’ from 7:30pm to 10:30pm, which the Environment Ministry arranged in conjunction with the scout association, Transportation Ministry and Male’ City Council, according to Mushaaid. “It’s for the benefit of the public, activities will be taking place on the streets for people to join and have fun,” he stated. “Plus, it will be difficult to capture the picture of Male’ from Funadhoo [island] during Earth Hour with vehicle lights,” Mushaaid added. Funadhoo is a small island adjacent to the capital of Male’ where the Maldives’ State Trading Organisation (STO) operates its fuel and lubricants department, housing 15544 tons of diesel and 600 tons of kerosene. Abdullah stated that activities have been organised nationwide, with larger events to be held on Kulhudhoofushi island in Haa Dhaal Atoll, Lhaviyani Atoll, Fuvahmulah Island, Addu City, other small islands as well as by resorts. Events in Male’ include an awareness walk, traditional music and activities. A wide range of institutions are collaborating to implement Earth Hour activities. The Maldives Girl Guide Association, the Maldives Youth Climate Network (MYCN), and other non-governmental organisations (NGOs) are providing organisational and voluntary help. Supporting partner institutions include the Ministry of Environment and Energy, the State Electric Company Limited (STELCO), the Police Services, Maldives National Defence Force (MNDF), as well as local media outlets. The Ministry of Home Affairs is facing criticism for publicly announcing the dissolution of nearly 1300 non-governmental organisations (NGOs) – 70 percent of organisations nationwide – without notification or supportive mechanisms. According to STELCO data, Earth Hour events in 2012 saved 1590.5 kilowatt hours of energy, 418.55 liters of fuel, and carbon dioxide emissions were reduced by 1.1 tonnes within an hour, as stated in the official Earth Hour Maldives report. Earth Hour is organized globally in partnership with the World Wildlife Fund (WWF), with millions of people worldwide, from 152 countries and territories, including 7001 cities and towns, participating in 2012. President Waheed Hassan Manik’s government pledged to ensure his government remained outspoken internationally in regards to the plight small nations faced from the potentially destructive impacts of climate change. However, private companies and international actors are leading renewable energy implementation in the Maldives while the government “prepares” for various solar power projects. Since early 2012, the Maldivian government has overseen the initial stages of a few new renewable energy projects. Waheed launched the Baa Atoll UNESCO Biosphere Reserve and Baa Atoll Conservation Fund in early 2012. Later that year, a marine biologist working in the Baa Atoll UNESCO Biosphere Reserve has reported the discovery of the remains of a baby shark and endangered sea turtle barbecue on the uninhabited island of Funadhoo, one of the country’s 14 priority nesting beaches legally protected under Maldivian law. Meanwhile, waste management remains a national human and environmental health dilemma. Establishing waste management systems on the islands has been an ongoing struggle. Most islands have waste areas that vary in quality and have no means of processing or removing trash from the garbage areas. 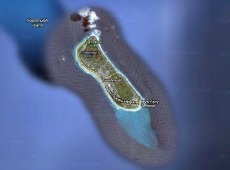 “Thilafushi is not what we want. The current conditions there pose serious health and safety threats to Bangladeshi workers living there and those toxins spread to Male’ and Villingili as well,” Ahmed Nizam, Solid Waste Management Coordinator for the Environment Ministry previously told Minivan News. Speaking to the Conde Nast Traveler publication in 2012 to promote “The Island President” film documentary, former President Mohamed Nasheed expressed hope that the country would continue to work towards becoming carbon neutral, but he also challenged the legitimacy of Waheed’s government. “We were making real progress. I hope the government will continue our policies. But you can’t have good policies without democracy. And you won’t address the climate change crisis without good policies,” Nasheed told journalist Dorinda Elliott.